Hello there, I have had this WPlus9 stamp set on my desk waiting to be inked up since it was released. I knew what I wanted to do with it but for some reason felt like I wouldn't achieve what I had set out in my mind. My card idea looked like this card by the amazing owner of WPlus9 Dawn. Although I had a similar idea before I saw her card, once I saw it I knew I wouldn't be able to get anywhere close to what her amazing card was like. Well, yesterday I decided just to go for it. Crafting is not about comparing yourself to someone else, everyone will always have different capabilities, strengths and abilities. That is the great thing about this crafting world, we can learn from each other. So for my card, I started off with a panel of cardstock which had been run through my Cuttlebug using the ME Femme Frames dies - have I told you lately how much I love these? 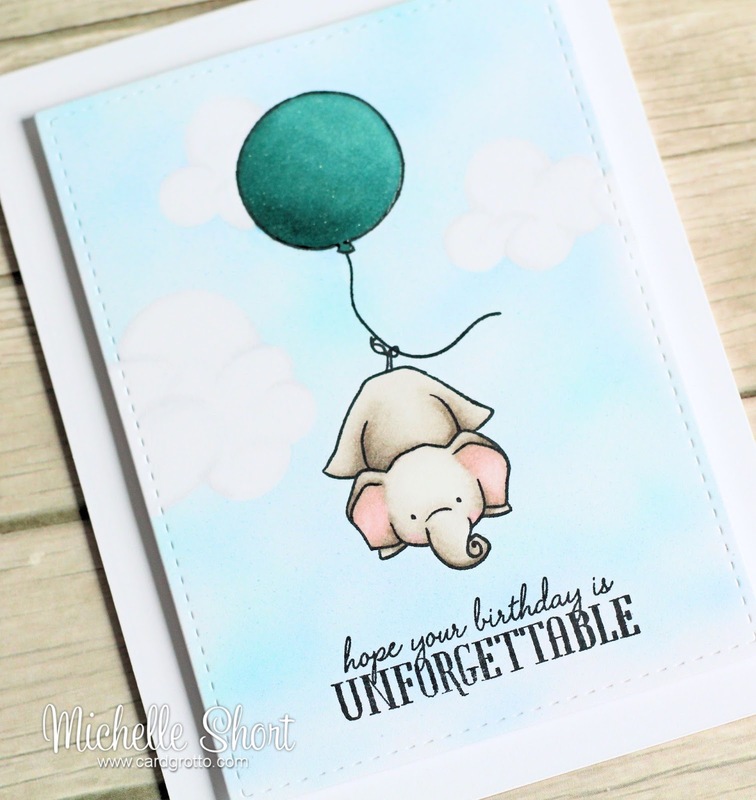 ;) I then stamped the elephant, sentiment and balloon from the set with Memento Tuxedo Black ink. I then masked off the elephant and balloon as well as die cutting some PTI clouds for masking paper too. I took out my Copic Airbrush (which I hadn't used in years) and added some shading with various blue Copic Markers. The elephant, balloon and clouds were then coloured with Copic markers as well. I added the panel to a white card base with foam and then added a liberal coat of Wink of Stella and Glossy Accents to the balloon. COPIC MARKERS - Sky: B0000, B000, B41, B91. Elephant: W1, W2, W3, W4, W5, W6, R000, R20. Balloon: BG72, BG75, BG78. Clouds: N1, Blender. I am happy with how it came out, although they are a little difficult to see in the photo, I feel I could practice some more on the clouds. Aren't those elephants just so cute? I love them! Thank you so much for visiting me today. I hope you have a lovely day! 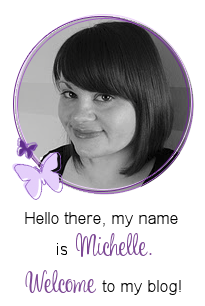 Oh my gosh, Michelle, this is absolutely darling!! 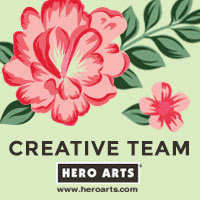 Love these sweet images and your clouds are fabulous. Super coloring! These elephants are everywhere I read at the moment! I think yours looks really nice with the airbrushing. Wow, love it Michelle! 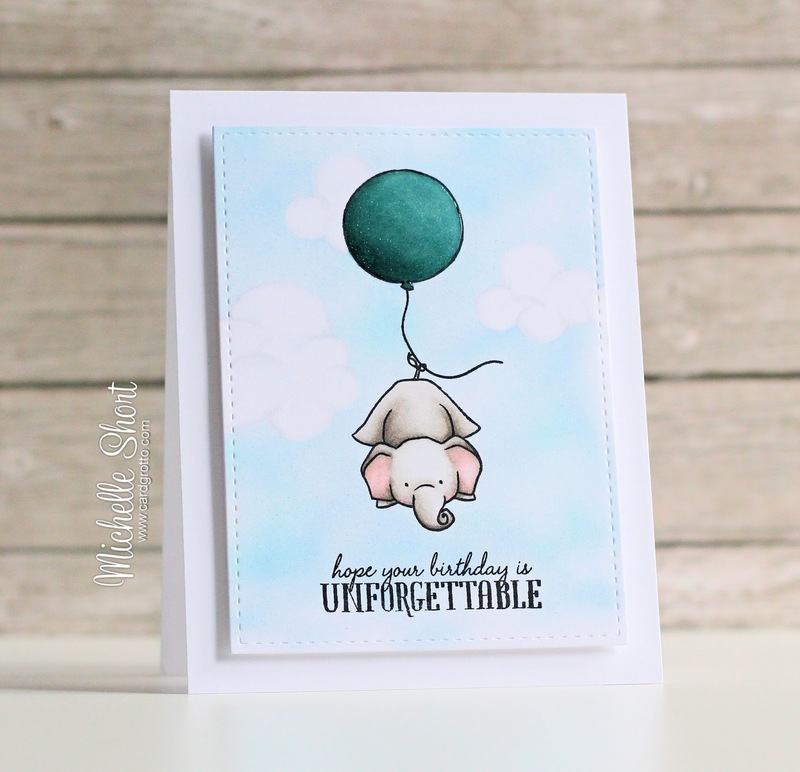 That airbrushed sky and your perfect colouring bring the cute elephant to life.